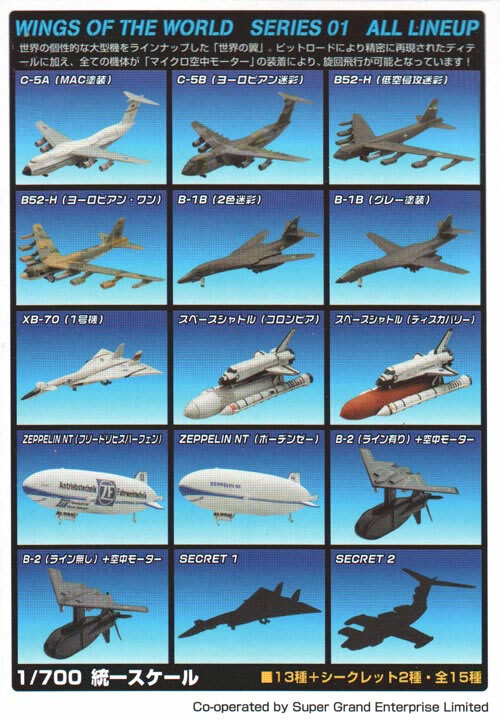 A series of high quality 1/700 true to scale aircraft from Takara. They are extremely detailed and finished to a very high standard. Each aircraft comes with a display stand. A motor can be clipped onto the bottom of each aircraft to allow them to fly through the air! Low altitude 2-tone green camouflage. Dark grey all over finiah. Comes with motor and kit to enable flying suspended from ceiling. Kit can also be used with other aircraft. XB-70 with two alternative front sections for supersonic and for landing. Russian Caspian Sea Monster Loon giant seaplane. People who bought this also like: Area88 1/144 Modern Jet Aircraft, Bandai 1/144 WW II Aircraft Series, Doyusha 1/100 Bf-109, Doyusha 1/100 Spitfire, Dragon 1/144 Combat Aircraft Series, Boford Sora 1/144 Aircraft Series, Furuta Choco-Egg Fighter Series 2, Furuta Choco-Egg Fighter Series 3, Furuta Choco-Egg Fighter Series 4, Takara 1/144 Wings of the Luftwaffe Series, Takara 1/700 Wings of the World Series, Takara 1/144 World Wing Museum Series, Popy Projekt Flieger Series.